A stylish and bustling urban area, River North is one of the fastest-growing and most desirable neighborhoods in the city. The area is outlined by the Chicago River on the south and west, Michigan Avenue (the Magnificent Mile) to the east, and Chicago Avenue to the north. Like much of downtown Chicago, it was rebuilt after the Great Chicago Fire of 1871, and quickly filled with municipal buildings, warehouses, worker housing, and shipping facilities to serve the port of Chicago. After a period of stagnation when the port relocated, the area came roaring back: over 10,000 new residential units have been built just since the year 2000, and the 25,000 new residents that have moved in give River North a fantastic urban identity. River North offers some of the best dining experiences in the city, with new restaurants offering exciting cuisine, alongside established favorites like Frontera Grill and several of Chicago’s top steakhouses. The go-to place for people who appreciate fine art and design, the neighborhood also houses many art galleries and photography studios. Late-night energy swells, with a plethora of trendy clubs and hotspots for drinks and dancing. Much of the new development in River North is condominiums, and several glass and steel high-rise buildings have sprung up in the last few years. The views offered from these units are spectacular – nowhere else will you see the glory of downtown Chicago and the lake in such impressive fashion. Residents are attracted to the views, the river, and the mixed-use commercial offerings of hotels, easy transportation, and restaurants. The new buildings are interspersed with River North’s old low-rise red brick buildings. River North is served by the CTA’s red and brown lines, and the entire ‘L’ system is a short walk across the river and into the Loop. Residents can easily access any part of Chicago by train or bus. Close proximity to the Kennedy Expressway is an added bonus. 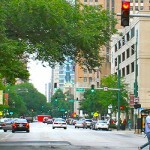 With its central location, residents of River North have fantastic access to many transportation options.